Electronic product life spans have become shorter. On average, consumers replace their computers every five years. Smartphones are replaced within two years, and home appliances are replaced once every seven years. Despite the prevalence of electronic products, only a small percentage of e-waste gets recycled, leading to increased environmental damage and pollution. In this article, we will explore four things you need to know about electronic waste and e-waste disposal before you decide to get rid of old electronic devices. Electronic waste or e-waste refers to electronic devices that people no longer use. These devices have reached the end of their life and no longer work as they were intended. Common examples of e-waste include computers and computer components such as keyboards, smartphones, microwaves, televisions, radios, printers, monitors, and electronic toys. Some of these electronic products contain materials that make them hazardous to the environment. For instance, old CRTs (cathode ray tubes) from televisions and monitors are hazardous to the environment. Some hand-held devices, mobile phones, and computer parts do contain valuable materials and substances such as gold, silver, copper, lead, and nickel that can be harvested, but they also contain hazardous material such as cadmium, mercury, and sulfur, which require special disposal. Why Should You Recycle or Repair Your Electronics? According to The Environmental Protection Agency, US consumers and businesses discard 2.37 million tons of electronic waste every year. Only 25% of discarded electronics end up getting recycled. The rest gets disposed in landfills and incinerators, and illegally exported to developing countries. Recycling your electronics not only protects the environment from toxic waste, but it also protects people from getting exposed to high levels of contaminants such as lead, mercury, cadmium, and arsenic. These toxic elements can lead to irreversible health effects, including cancers, miscarriages, neurological damage and diminished IQs. What Can You Do with E-Waste? Circuit boards typically use gold. Connective wires use copper, and soldering uses silver. When these electronic devices are properly recycled, you can sell these precious metals for a profit and use them to create something completely new. For example, cell phone batteries can be used to make new smartphones and batteries, while zinc and aluminum from laptops and tablets can be used for metal plates, jewelry, cars or art. The best way to get your electronics recycled is to work with a licensed electronics recycling company. 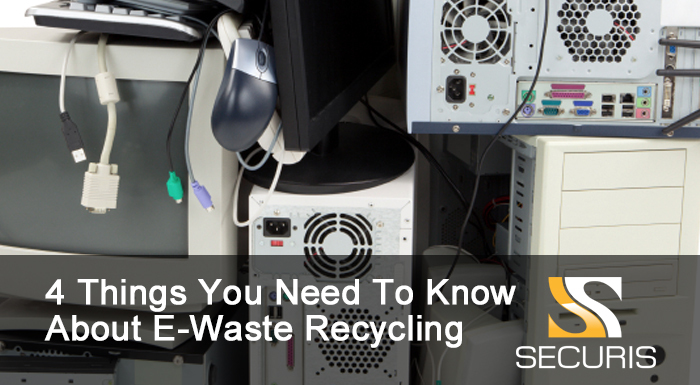 There are two standards for recycling electronics in the United States. Each standard has certification programs that the recycler has to go through and maintain. The first standard is known the e-Stewards Standard for Responsible Recycling, and Reuse of Electronic Equipment, or e-Stewards for short, and the other is called Responsible Recycling (R2) Practices, or R2. It’s a good sign if an electronics recycler has either one of these certifications. In most cases, they will be more trustworthy than a recycler without one. Securis has been an R2 certified electronics recycler since 2013 and joined the GSA Schedule 36 of approved contractors to provide data destruction services to the United States Government in 2007. Our industry experience, combined with our unique expertise in e-waste recycling makes an ideal partner for your electronics waste needs. Contact us today to find out how we can help.